Doing Software Development, or the similar Internet Application Development, tasks face one serious problem: How to organize the source codes, images, and sample code? And what about your Backup? Of course, if your disks are large enough, you may just want to keep it all online. But what if that disk fails? And why do you want to keep all the old stuff around that you just need once a year? Here comes abeMeda! 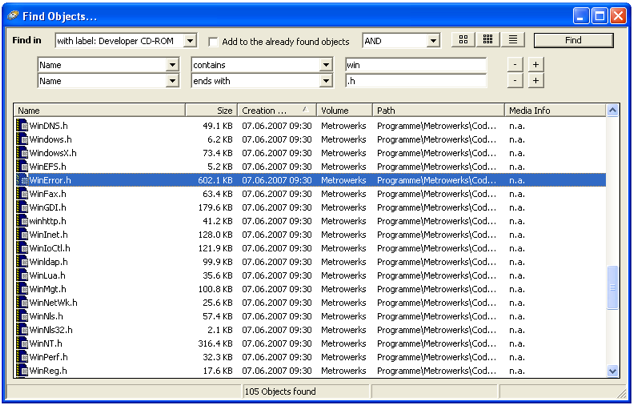 Burn your done projects on CDs or DVD-ROMs, and then catalog these with abeMeda just once. Do the same with the loads of sample code disks, and the Developer DVDs you are getting. You can then immediately search your entire archive with abeMeda. abeMeda will quickly show you where your needed source files are located, and when you had last modified them.